A simple way to cook Nepali yellow lentils in a culinary fashion. A must try recipe! Blend the soup with ghee until very smooth and creamy. Serve with Cilantro oil, chili powder and fresh nimkies. 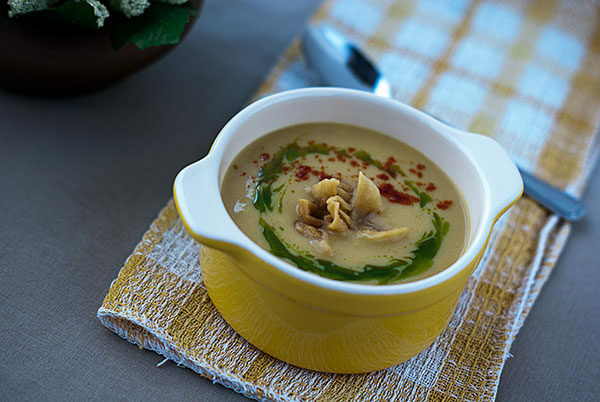 - Above recipe is an alternative way to cook and serve yellow lentil soup in a western fashion. It includes culinary techniques in a restaurant style. - Any desirable yellow lentils can be used to prepare this recipe. Please keep in mind that cooking time may vary according the nature of the lentils. - Cilantro oil could be an optional which can be substituted with micro cilantro [baby cilantro leaves] or fully grown cilantro leaves. - In a boiling water, boil cilantro for 10 seconds, strain and dip in ice water - Remove from ice and blend thoroughly with oil - Strain the through the cheesecloth - Use for upto 3 weeks while refrigerated. - Enjoy this oil by drizzling over all kinds of pasta, soup and salads.